Pullbox Previews - Superstar Writer Brenden Fletcher Joins Titan's Robotech! Pullbox Previews: Superstar Writer Brenden Fletcher Joins Titan’s Robotech! SUPERSTAR WRITER BRENDEN FLETCHER JOINS TITAN’S ROBOTECH! ACCLAIMED WRITER JOINS SIMON FURMAN AND HENDRY PRASETYA TO USHER IN A RADICAL NEW ERA FOR ROBOTECH COMICS – STARTING IN 2019’S FREE COMIC BOOK DAY! 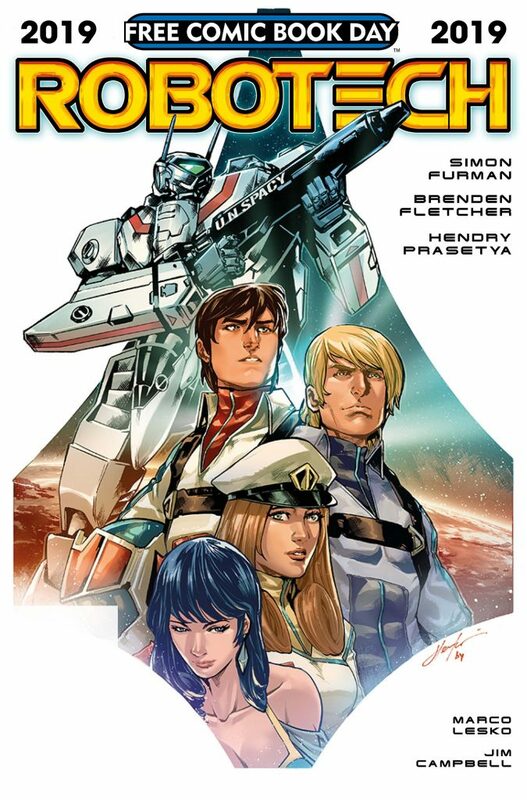 Titan Comics are pleased to announce that best-selling writer Brenden Fletcher (Isola, Motor Crush, Power Rangers) will be joining the superstar Robotech comics team of Simon Furman and Hendry Prasetya on the deck of the SDF-1 for continuing Robotech adventures – based on the legendary ‘80s sci-fi animation by Harmony Gold. Kicking off with a special primer issue on Free Comic Book Day 2019 (Saturday May 4, 2019), fans can expect this special edition to shine a spotlight on unseen events and major hints of things to come, as the Robotech series charges up for an all-new spectacular storyline called Event Horizon. First airing in the USA in 1985, Robotech was the gateway to anime for many fans – capturing their imagination with its epic generational storyline involving war, romance, and, of course, the transforming Veritech fighters that defend the Earth against extra-terrestrial attacks. Produced by Harmony Gold USA, the original 85-episode series delved into humanity’s struggle against a series of alien invasions, from the gigantic Zentraedi to the mysterious Invid, battling for control of advanced alien technology that crash-landed on Earth. Robotech joins Doctor Who: The Thirteenth Doctor as the second of Titan’s two Free Comic Book Day offerings. Look for further details on the new direction of Robotech very shortly. To keep up to date with news about Titan’s Robotech comics, follow Titan Comics on Facebook, Twitter or Tumblr. Harmony Gold has been active in the production, acquisition and distribution of quality programming worldwide since its inception in 1983, with a library of titles that includes the hit animated series Robotech. Sony Pictures is developing a live action feature film of Robotech with James Wan set to direct. The company also owns the Harmony Gold Preview House, a landmark state-of-the-art screening and event facility. Titan Comics offers astounding comics and graphic novels from the world’s greatest licensed properties, alongside creator-owned comic books from new and world-renowned talent and classic graphic novels re-mastered for brand-new audiences.